After all the political argy-bargy, the final decision on the controversial oil pipeline plan is due as The New Republic explains. But the oil producers are already moving their product in other ways. Whether it’s still worth it with oil down near $40 a barrel is another matter. The speculation in private, however, is that the writing may be on the wall for Keystone at least. “The rumor is that the decision to deny has been made, and they’re just waiting for the right time and venue,” an unnamed source familiar with the company told The Canadian Press this month. Republican lawmakers in the U.S. have echoed the pessimism. “I don’t see a scenario where the president would sign off on Keystone,” Senate Energy and Natural Resources Chair Lisa Murkowski told Bloomberg recently. Then there are Obama’s own words over the last year, which suggest he’s leaning against the project. This decision will be Obama’s final word on the Keystone XL pipeline. But for TransCanada, it won’t be the end of the story. 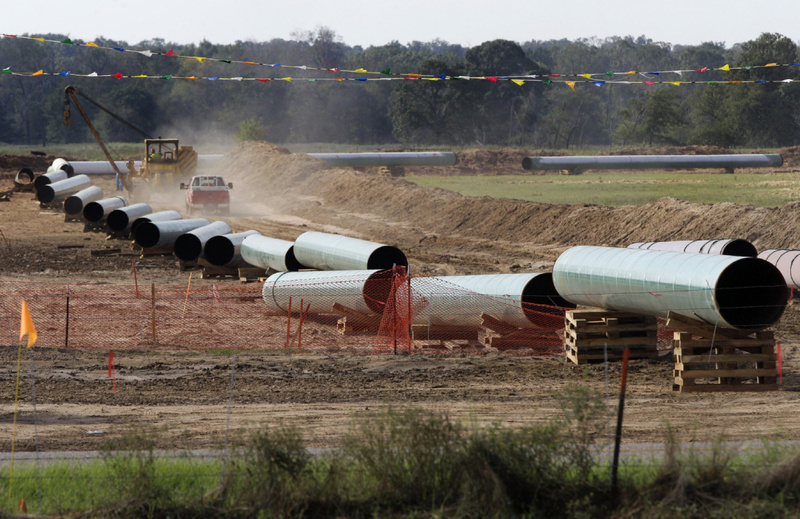 Even if its permit is rejected, TransCanada has a few paths forward for keeping Keystone alive. The company may eye a NAFTA lawsuit arguing trade discrimination, or it may submit a new application under the next president—if it’s a Republican, the company would face a much easier time. In the meantime, rail is the go-to substitute for missing infrastructure to ship oil from Canada to the U.S. Sixty percent of Alberta’s unprocessed oil already makes its way to American refineries by rail and pipelines. And in 2012, Canada exported 16,000 barrels of oil per day by rail to the U.S. In the first quarter of 2015, it exported 120,000 barrels per day, which might rise depending on whether global oil prices begin to increase again. As green organizing has focused on pipeline infrastructure, it’s done little to stop the explosion in tar sands shipments by rail and tanker. Full report: No Keystone, No Problem: The Oil Industry Is Making Other Plans | The New Republic. Corrosion is an issue for pipelines. One possible cause that maybe gets little media attention: GICs. Obama’s buddy Warren Buffett (Berkshire Hathaway) purchased Burlington Northern Santa Fe for $34 billion five years ago. By the beginning of 2014, BNSF has ramped up its operations so it was moving 600,000 barrels of oil per day. In terms of refined gasoline that is enough to fill the gas tanks of 1.35 million cars. It is more than ten times the amount moved in 2010. Buffett says he supports Keystone, but I can only see that if he has a financial stake. Actions speak louder than words when it comes to politics. Pipelines are a cheaper way to ship oil- because they are a more energy efficient way to transport millions of tons of material. Or we transport hundreds of billions of tons of water via pipelines, and it uses less energy and therefore water is cheaper. If we had to ship water via trains, it would use a huge amount of energy, bankrupt the nation [but it would be good for the rail business]. Since it costs more energy to ship bulk material via rail as compared to pipeline, it results in emitting more CO2 per ton shipped, and it does not matter if the trains were electric- it still would still result in more CO2 emission- probably more CO2 emission. Anyhow, the trains are diesel powered. Indeed that is interesting and curious. It’s a key insight that’s challenging to interpret sensibly. Whether it’s still worth it with oil down near $40 a barrel is another matter. The Keystone Pipeline (Phase I), delivering oil from Hardisty, Alberta 480-kilometers (300 mi) to the junction at Steele City, Nebraska and on to Wood River Refinery in Roxana, Illinois and Patoka Oil Terminal Hub (tank farm) north of Patoka, Illinois, completed in June 2010. As long as you understand most of the ‘Activists’ are actually paid Astroturf, or wet behind the ears Useful Innocents it all of a sudden becomes much easier to understand. gbaikie: on the other hand the trains already exist, but the pipeline doesn’t. Gail, I had some really good conversations with the activists protesting the TransMountain pipeline and I think their belief and expectation is that there will be no need for oil transport in the tangibly near future. I did not think at the time to ask them why they were not out blockading the exponentially growing number of oil trains. Some of the protesters were really good, very intelligent, notably endearing people with whom I felt a very strong personal connection. I did not have the heart (or the time) to discuss climate with them. One thing I found quite notable (a key insight) was that they were unaware that a nearby major pipeline leak in 2007 had destroyed homes & marriages and triggered a long ban on recreational summer boating (due to enduring toxicity in the inlet). Another thing I found anomalous was the number of propane canisters lying around the protesters’ campsite. A logistical challenge the protesters were having was cell-phone battery charging, needed for their live social media engagement. This and other logistical challenges were in part overcome by a small army of volunteer couriers running errands between the mountain park and the adjacent city. The other part of the equation I find interesting is defense. I would be curious to hear a few sensible military strategists outlining the benefits, drawbacks, & bet-hedging of pipe, rail, & road transport during times of peace and a range of levels of conflict. Ok, enough of this peripheral stuff… more interesting things to do, like exploring nature… and that includes sea-kayaking & hiking, not just relatively boring climate data exploration!! It’s probably more difficult to stop trains running day and night than to prevent a pipeline being built. DD More tells part of the story. In fact 3 of the 4 phases of Keystone are already complete. as long as obam the destructor is around, and needs to continue paying off his friends, the keystone will be blocked. That’s the point I’m trying to make about strategy & bet-hedging. A localized symbolic oil train protest would be easy to stage, but I’ve not seen news about any such protests if they exist. A diffuse rail & especially road network has different implications & challenges for both environmental & military defense. It might be entertaining watching military & environmental strategists questioned on the hot-seat for honesty about pros, cons, & bet-hedging. A strictly daily operations economic formula (cost of getting stuff from point A to point B today) that doesn’t include longer-term environmental & military defense responsibilities probably gives a simpler answer, but that doesn’t explain why all of the stakeholders in the oil transport debates appear biased & ignorant. I could see comparative pros & cons for all of the viable options in our local case and none of the options was a clear winner but rather just a different compromise shifting the balance of impacts and benefits across stakeholders …and there are multiple stakeholders wanting incompatible things — far from the oversimplified, misleading mere polarity portrayed in the media, the stakeholder landscape is multi-polar. I was invited to participate in pipeline hearings, but I declined having been advised that input would influence only public relations framing and not decisions. Nineteen months have passed since GE Transportation, a subsidiary of General Electric, opened the plant near Texas Motor Speedway. The operation has steadily grown and now employs more than 500 people — two weeks ago adding a second shift to meet growing demand from railroads, Amaya said. The factory now cranks out an average of 1.2 locomotives per day, he said. Plus GE exports hundreds of locomotive to China, which needs of a lot them to haul massive amounts of coal. One could also say that since less coal is being used domestically in US, more demand is needed for locomotive use, so using locomotive instead of lower cost and more efficient pipeline create more demand for locomotive that GE can sell. The cynicism of Obama is matched only by the care he takes in lining the pockets of his cronies and insiders. Using rail, the most expensive, most energy intensive, environmentally hazardous and least efficient way to move the oil only helps his backer, Warren Buffet. I could move by rail the same amount of oil at the same rate using less energy but not rail as it is now. The technical basis is the lower fluid loss in air than in a pipe. Boils down to common sense, compromises. The infrastructure cost would be high. Here in England we still use pipelines from WWII, amortised by war. Similarly could move freight at near zero energy usage half way around the world but the infrastructure cost would be massive: evacuated pipe. That idea can be extended to an “oil” pipeline carrying wheeled vehicles in a vacuum. Too complicated. I suppose similarly some products to be transported could be gassified. Too complicated. Always comes down to engineering, all forms of costs. Hardly surprising given that we were all clearly tipped off years ago that the decision had already been made and that the hearings were just for show and gathering intel on how to frame rationale. A basic problem with rail is loading and unloading which requires time. from America’s largest oil field at Prudhoe Bay to the port of Valdez. So 2.1 million is .3 million tonnes per day. if shipping at lower volume with larger pipe it goes so slow that it could freeze [or significantly increase it’s viscosity] which is less of problem in the lower 48.
grade is problematic. And to accelerate [get to 20 mph in short period of time or go up a hill] requires weight over the wheel to get enough traction. So if had tracks without much grade, if you use the track 24 hours a day, and if one load and upload quite fast [say 1 hour]. You might handle as much as 4 foot diameter pipe, but seems unlikely.